Cinco de Mayo is this weekend! 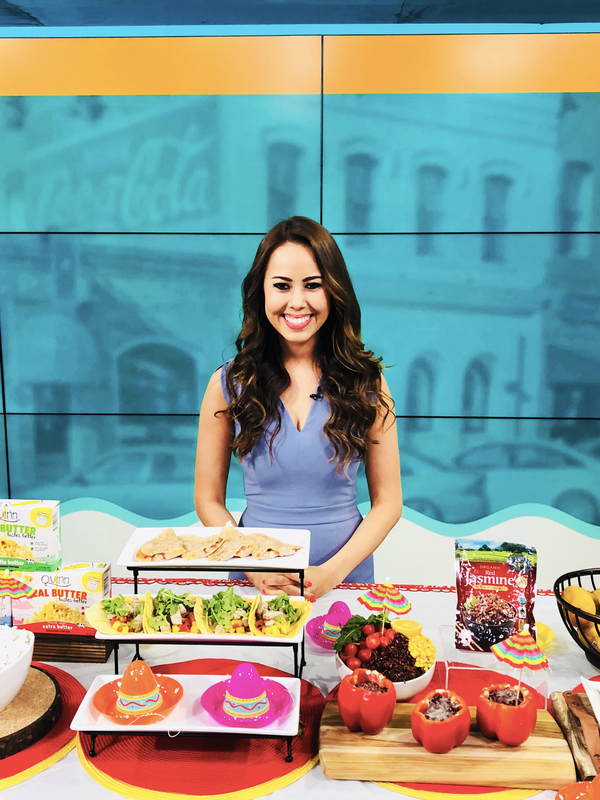 Today I shared some tips and simple swaps to put together a nutritious spread on Jacksonville Florida’s News 4 JAX! Popcorn! 3 cups of popcorn is equivalent to 1 serving of whole grains. I shared a microwave popcorn made with grass-fed butter, which is naturally higher in vitamins A, D, E and K. You can also make your own using olive oil or coconut oil if you want it a little sweeter. It’s not Cinco de Mayo without tacos and quesadillas. I shared Smithfield’s Fresh Pork Tenderloin, which is packed with protein AND a lean cut of meat. In fact, pork sirloins and tenderloins are recognized by the American Heart Association as a “heart-healthy food” – so these are dietitian-approved! Great if you are entertaining a large crowd for Cinco de Mayo or simply need a quick and easy weeknight dinner. For non-meat eaters, I shared vegetarian taco bowls and stuffed red peppers made with Lundberg Family Farms’ Thai Hom Mali rice which is pre-cooked – all you have to do is heat to eat and its ready in 90 seconds! It’s gluten-free, certified organic and makes for an easy whole grain addition to any meal – something I encourage as a dietitian because you get that filling fiber and B vitamins, which are important for metabolism. For dessert, I shared a naturally sweet treat that you can feel good about feeding your friends and family: Dark Chocolate Dipped Mango Pops. Recipe here. Mangos are a tropical superfuit, 1 cup meets 100% of your daily vitamin C needs, and they are available year round thanks to their six varieties that have staggered growing seasonings! You can also add them to salsas and cocktails – they’re super versatile and perfect for the holiday.